There are few places in the world that are as beautiful and inspiring as Yosemite National Park in the Sierra Nevada Mountains of California. When it comes to iconic locations that define a country such as the United States, it is hard not think of images of Half Dome or Yosemite Falls, both of which have been made famous over the years by photographers such as Ansel Adams and Galen Rowell that each helped define photography for their respective generations. While many people know that I grew up in the Bay Area, few actually know of my historic ties to Yosemite. My great great grandfather was a man named William E. Colby and he was one of the original members of the Sierra Club with John Muir. Together, they worked hard to help protect Yosemite in the early 1900’s and when Muir passed away in 1914, William became the director of the Sierra Club, staying in the position for nearly 49 years before retiring. I feel this is part of the reason why Yosemite has always felt like home. In April of this year (2014), I worked on a project for the #DreamBig initiative with Visit California and Yosemite National Park. One of the many things that came out of the project was the video that you see below. Enjoy! Between my love of the park itself and my family’s history Yosemite, I have a clear understanding of why so many photographers have it listed as a “bucket list” location. Because of this, I decided to put together this comprehensive guide to visiting Yosemite, from a photographers perspective. I cover a lot of topics; from information on which airports to fly into, to my favorite spots to photograph, to my favorite times of year to visit. There are plenty of amazing things to see in Yosemite National Park (which is open year round). Located in the heart of the Sierra Nevada Mountains, Yosemite offers a multitude of ways to visit this amazing national park. While most people will be flying into one of the airports below, local travelers or residents have the ability to drive using Highway 120 (East/West), 140 (South West/North East) or 41 (North/South) to enter Yosemite Valley itself. While HW 120 and 41 tend to get closed during snow storms in Winter & Early Spring, HW 140 tends to stay open, so check for Yosemite Road Conditions HERE. As you can imagine, each of the different seasons (winter, spring, summer and fall) offer different experiences inside the park. Before your trip, be sure to check the current weather conditions as well as take a peek at Yosemite’s various webcams to give you real time updated information. Winter is one of the best times to visit Yosemite. Not only do you not have any crowds to contend with, but if you are fortunate to visit during a winter snow storm, there is nothing quite like seeing Yosemite caked with a layer of snow. However this also means that much of the park is closed down outside Yosemite Valley. Glacier Point Rd and Tioga Pass road are both generally closed during the winter because of snow and generally don’t open until the end of April at the earliest. Overall my favorite time of the year in Yosemite, a spring visit to the park can offer nearly everything we have grown to love and appreciate about its beauty. The waterfalls will still be flowing from the winter snow melt, everything will be lush green as the park continues to thaw out from winter, the dogwoods are in bloom (in April) along the Merced River and if you visit early enough in April, you still have a chance to catch a late winter snow storm that could blanket the Valley for a day or so before melting off. As mentioned above, count on Glacier Point Rd and Tioga Pass to both open up by late April, giving you access to other parts of the park itself. By far, summer is the most popular month for visitors to Yosemite. This generally means that you can find large crowds of people in Yosemite Valley and most of the accommodation options (including camping) completely booked solid. If you are planning on taking your family to Yosemite in the summer, plan ahead. Also note that while all of the park will be open in the summer (including a few of my favorite parts, like Tuolumne Meadows), most of the waterfalls will have dried up by this time. Ultimately, because of the crowds, it is hard to recommend visiting the park during the height of the summer months, atleast if your focus is on photography. If you want to beat the crowds of summer and have a slightly cooler temperature to contend with, visiting during fall might be perfect for you. While you don’t get the lush greenery of spring, the fall transformation can be beautiful in its own right. For the most part, you won’t find crazy fall color in Yosemite like you do in Colorado with the Aspens or in the Smokey Mountains of North Carolina, but you will certainly see a color change move throughout the park, which can be incredibly beautiful. When it comes to finding a place to stay in Yosemite, you have a variety of options, depending on the time of year that you visit and where in the park you wish to stay. Let’s break down the options based on the different regions of the park. In Yosemite Valley, you will by far have the best selection of options for places to stay, ranging from the high end to a plethora of camp sites that are open for a good portion of the year. Ahwahnee Hotel – The high end option for those wanting to stay in Yosemite. The hotel itself is incredibly impressive, although certainly expensive. Needless to say there is nothing else like it in Yosemite. Yosemite Lodge at the Falls – Located close by Lower Yosemite Falls, you won’t spend as much as if you stayed at the Ahwahnee, but it isn’t cheap either. Regardless it offers probably the best location of all the hotels, has comfortable rooms, good dining options and wifi (although I wouldn’t count on it working in your rooms). Curry Village – For those that don’t want to spend a lot of money, but also don’t want to sleep in a tent, Curry Village offers large cabins and tent cabins (which can come heated). The trade off? You will be in fairly close proximity to your neighbors. Either way the beds are comfortable and you can’t beat the price if you want to stay in Yosemite Valley itself. Housekeeping Camp – Located along the Merced River, the Housekeeping camp is a great place to stay in later spring, summer and early fall. Perfect for those that want to camp, but without sleeping in the tent. Each unit of the Housekeeping camp camp (266 units) can hold up to 6 people. Do note that the beds don’t come with sheets, blankets or pillows (although you can rent them for $2.50 a night. Yosemite View Lodge – The only accommodation listed that is actually outside Yosemite Valley…in fact it is outside Yosemite National Park itself. That being said, it is located just 20 minutes away from the park entrance, offers very affordable spacious rooms, has awesome in-room wifi (something no other accommodation in the park offers) and has the Merced River flowing in its back yard. If I am not camping, this is generally my favorite option (mostly because of the wifi). Lower & Upper Pines Campground – Located within Yosemite Valley, this is one of your best camping options. There are plenty of spaces (for both tent and RVs) and you are located in an area with pretty awesome views of Half Dome. What’s not to love about that? Camp 4 – If you are heading to Yosemite to do some rock climbing, this is where you want to stay. Known for its climbing/adventure persona, Camp 4 is located right up against the granite walls of the valley itself. First come/first serve only. This area is closed during the winter months, so keep that in mind and be sure to check road and camp site conditions. Tuolumne Meadows Lodge – While the term lodge is a touch misleading, the Tuolumne Meadows Lodge is open from mid June through mid September and offers you 69 canvas tents (similar to Curry Village). Tuolumne Meadows Camp Ground – Just as it sounds. The main spot for camping (tent and RV) in the high sierras of Yosemite. Tioga Junction Campground – If you find that all of the Tuolumne Meadows options are full (common in the summer months), you can head just outside the parks east entrance and camp at the Tioga Junction Campground. This campground is first come/first serve. Wawona Hotel – Located between Yosemite Valley and Mariposa Grove, this is your only option to sleep with a roof over your head. That being said, the hotel is a National Historic Landmark that was built during the Victorian era. It is great for those that want a little peace and quiet compared to the sometimes crowded experiences found in Yosemite Valley. Wawona Campgrounds – Located near the Wawona Hotel, this is a great half way point between Yosemite Valley and Mariposa Grove in terms of camping. Summerdale Campground – The closest campsite to the Mariposa Grove of giant sequoia trees is here. While places like Tuolumne Meadows or Yosemite Valley get all the attention, the truth is that Yosemite has hundreds of miles of amazing back-country hikes that are waiting to be explored. However to stay overnight, you will need to secure a Wilderness permit from the NPS (National Park Service). All the information you need can be found HERE. While all the information I have covered so far is important for anyone’s visit to Yosemite, I imagine that most of you want to get an idea of places to photograph. Wait no more! One of the most iconic views of Yosemite can be found at the Tunnel View lookout point. While this location is generally a sunset location (to help you get some color on El Capitan, Bridalveil Falls and Half Dome), an early morning trip here could prove fruitful if it is cold enough to bring a layer of fog into the valley. Wait to long and the mid morning sun will burn it all off. 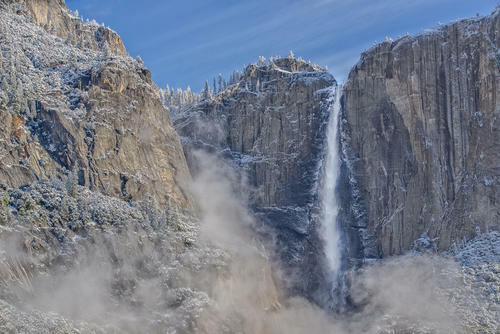 A LAYER OF FOG FILLS YOSEMITE VALLEY AFTER A RECENT SNOW STORM. Located near the west entrances to Yosemite Valley, Bridalveil Falls is a beautiful waterfall to photograph during the late winter/spring months. For the best views of the waterfall, check out Tunnel View, Bridalveil Falls Trail, field near Bridalveil Creek, Gates of the Valley. In the morning the waterfall is in the shade and by afternoon it will have some light on it (which will fade before sunset). AFTERNOON LIGHT PEAKS THROUGH A PASSING STORM TO LIGHT UP BRIDALVEIL FALLS – VIEW FROM TUNNEL VIEW. One of the icons of the park, the massive granite face will be one of the first things to greet you as you enter the Yosemite Valley. It is amazing to know that people scale El Capitan on a daily basis in the summer…some without any ropes at all. Because of its location and the directions it faces because of its size, you can actually get nice light on El Capitan during both sunrise and sunset (although the later is certainly more popular). It is best viewed from Tunnel View, Gates of the Valley, the field near Bridalveil Creek, El Capitan Meadow,Cathedral Picnic Area. Next to Half-Dome, Yosemite Falls is probably the most iconic feature of Yosemite National Park. The waterfall itself is actually 3 waterfalls, upper (the tallest), middle (not visible from the ground) and lower (most accessible). While you can photograph Yosemite Falls at any time of the day, if you happen to visit during spring, be sure to make your was to the Lower Falls around 7am – 8am to witness a beautiful rainbow coming out of the falls mist. While the waterfall is seen from much of Yosemite Valley, it is best viewed in these locations: Swinging Bridge, Lower Yosemite Trail (Spot 1, Spot 2), field off of Southside Dr, field just south of Ahwahnee Hotel. THE VIEW OF YOSEMITE FALLS FROM THE FIELD NEAR THE SWINGING BRIDGE. When you think of Yosemite, it is hard not to envision Half Dome. Not only is it the icon for the park itself, it is also used around the world, including in the logo for North Face. Most photographers attempt to capture Half Dome during a storm when you have dramatic light or during sunset. With sunrise, the sun often rises at the wrong angle most of the year, although with the right clouds, you can still get some pretty amazing photos. There are a variety of spots to get awesome views of Half Dome: Sentinel Bridge, field opposite Lower Yosemite Falls trail head, Glacier Point, field opposite Curry Village, Merced River Spot outside Yosemite Village parking (sunset). HALF DOME AFTER A LIGHT DUSTING OF SNOW. HALF DOME AT SUNSET FROM A SPOT JUST OFF THE YOSEMITE VILLAGE PARKING AREA. SHOT WITH A SONY A7R. A gorgeous series of three granite peaks set in the heart of Yosemite Valley. The Three Brothers are great during a winter snow storm or if you have dramatic clouds. Catching it at sunset can also be pretty spectacular! The best view is from THIS spot near Sentinel Beach. THE THREE BROTHERS AT SUNSET OVER THE MERCED RIVER. While the Merced River flows throughout the Yosemite Valley, my favorite time of year to photograph along its banks is during spring, when the dogwoods are in bloom. While the spots for the best dogwoods change year after year, I have found these two spots to be fairly solid. Spot 1, Spot 2. Located in the high sierras, Tuolumne Meadows is a beautiful location that sadly doesn’t get the attention that Yosemite Valley does. While it doesn’t have the giant icons of the valley like Half Dome, it is an incredible beautiful and serene meadow that is worth exploring. You can have luck at either sunset or sunrise here. Directions. Located past the Eastern Entrance to Yosemite National Park, you will find the small town of Lee Vining at the gorgeous saline body of water, Mono Lake. Most photographers that visit Yosemite also try to spend atleast one or two days photographing Mono Lake (if the roads are open) as the mineral deposits that have created large tufas towers along the southern edge of the lake are fun to photograph. I have had success with both sunset and sunrise here, although the later is what normal is recommended if you had to choose one or the other. (Spot 1, Spot 2). You won’t be disappointed. Directions.